For years I have been experimenting with amplifying the energy field and altering the structure of water by way of sacred geometry, thought and mechanical means. Certain patterns have been stuck in my mind for a long time, primarily the Seed Labyrinth and the Flower of Life. These were among the most ancient of patterns probably going back before recorded history appearing all over the world in many cultures. Figuring there must be even more to them than the mathematics and spiritual aspects we have come to know, I tried to find a way to tie them all together in a working device. One day while staring at the labyrinth at Chartres it came to me. Perhaps they were, or could be, among other things, possible design elements for "machines". Victor Schauburger described how the meanderings of streams energizes and structures the water by way of vortex action, absorption/adsorption, left and right turns, eddies, mineral deposits, the hydrological cycle and such. What seems most important is the path the water takes (movement) giving it life and richness. Humans like to dam and/or straighten waterways, remove streamside trees and vegetation for efficiency and land management while killing the potential in the water, heating it up and altering the streambed leading to silting, stagnation, erosion and lack of oxygen. Schourberger predicted that this and pollution plus monoculture and its practices, would eventually lead to the spiritual decline and malaise of humans due to the loss of subtle energies available to the water and atmosphere (and, therefore, us) directly related to these activities. Richness derived from the earth influences water as it slowly makes its way to the heavens and back again as rain is what supports all life on earth. A garden perks up more after a rain shower than after hand watering because rain contains this complexity of amplified subtle energies and electrical charges. However, what is also important to the well being of all life on earth is the nurturing of the unseen inhabitants of this world which are the pattern holders and form builders of all that is. Something in our nature or culture somehow subverts belief in anything that can’t be seen or detected with the five senses so we overlook the realms that give shape to reality as we know it. Some members of the animal kingdom see within a spectrum of light that we do not so the world appears different to them compared to us. But it is still the same world. With our nervous system we can, with some practice, communicate with nature directly. While some are hardwired to see or hear these realms most do it by way of muscle testing or dowsing. The water labyrinth was first envisioned as an energizer of water with possible interactive properties. After a proof of concept model was made I realized its potential for environmental healing because it energizes water to such a profound degree that it literally acts as a broadcasting station with a range of many, many miles. What I broadcast are the “patterns of perfection” which include the vesica pisces, flower of life, Metatron’s cube and the words Love and Gratitude with the intended audience being the unseen intelligent realms and the water itself wherever it encounters other water in any form. The energy field of water passes through anything and informs other water wherever it finds it, be it earth or sky. Also, one trip through the labyrinth clears any negative information the water may hold. I, as many others, consider water a life form. By giving back to these intelligent energies, with intention, some of the subtle information lost by the practices of man, I hope to help the environment and, ultimately, us humans. Use no ferrous metals in the construction – only brass, copper, plastic, glue, wood, glass, etc. Try to use as few metal fasteners as possible. Ferrous metals can alter the natural energy field produced within the device. The shorter the path (less intricate) of the labyrinth the faster it will build up the energy field for a given pump size. Don’t force the water through the labyrinth at too high of a pressure. It should be able to flow at a pace that seems appropriate. It should be kept in a cool location with subdued light as this helps prevent algae build-up. I add a few ounces of Ellis Water to help prevent this but it's not totally necessary. Perhaps a piece of silver would suffice although I have not tried this. 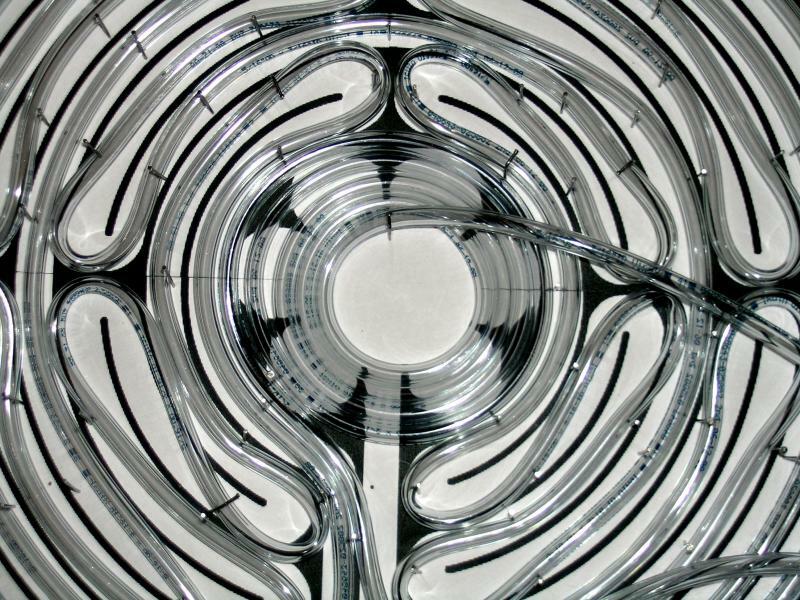 Use distilled water only or the labyrinth tubing will become cloudy and calcified. I also energize my water as explained in the section Structured Water. The first labyrinth I built was the labyrinth at Chartres. I used this as the model for testing the rate of water flow, time required for energy field expansion, changes in water quality, arrangement of parts and testing of sacred geometry on the energy field. Next I made a Seed Labyrinth, as this was deemed more appropriate for offering patterns for use by nature. Also the energy field builds up much quicker. While charting the energy field expansion I found that the fewer physical structures the field has to pass through the faster the field grows. That is, while outside in the garage it grew quickly as it encompassed the yard and beyond but from the back of the house it grew more slowly as it encountered walls, electrical wiring, appliances and such. How I think the water labyrinth works might offer some insight as to how walking a labyrinth works for healing, contemplation and spiritual purposes. Wherever we go we leave an etheric trail. It is part of a mechanism that allows a remote dowser to track a missing person. We alter the space around us with thought either consciously or unconsciously and by our presence. We are made mostly of water and have an energy field because we are bioelectric. As we move through the labyrinth this trail lingers and the further we travel the more we encounter this energy from different perspectives (closer to and further from the source, the labyrinth’s center) as our contemplation and resulting energy field inform one another along the path, both abstractly and physically. The water in our makeup is being energized at the same time. For example, there is a technique in experimental filmmaking called scatter-framing. It is a dynamic comparison in time of where an action is and where it was a few frames ago. Visually it produces a “chugging” effect – a few steps forward and a few less steps back all the while moving forward in unity. It seems an apt metaphor. This movement could also be described as an oscillation, a frequency that resonates individually by way of our brain waves and chosen speed through the labyrinth allowing us to resonate with our higher self. I also believe the labyrinth is a metaphorical as well as physical path that water follows to be informed. It’s the “path of the wild river” that passes information from the subtle realms to the heavens and back again, all the while absorbing and passing on, over and over. Water is a recording device just like crystals are. Everything is designed to evolve to a higher state. It is the path. It is known that a labyrinth in the landscape built with intention and in partnership with the local nature spirits can attract to it both water and energy leys, often referred to as ley lines. One is the lifeblood of the planet and the other is the neural net – the mind. Are we so different that we aren’t affected by the same elements in much the same way? I don’t think so. Years of property clearings have shown me how nature responds when we remove that which is harmful or degrading and let nature take Its rightful course. I have seen plants return to life, stress removed from the local animal kingdom and people begin to thrive again. Harmony and balance return. When you give back you are rewarded in many subtle ways and one of the most noticeable effects is manifestation. It seems that with my partner and I just about whatever we need at any given time is provided. Mostly just simple, meaningful everyday life things that make you happy or remove stress. I don’t believe that it is any one thing that we do that accomplishes all this but rather the system we adopt that supports a meaningful life that respects and acknowledges nature, seen and unseen. The Water Labyrinth doesn’t remove disruptive geopathic stress. That is what the Earthfield Harmonizer does. But it does offer to nature primal information that may have been “forgotten” or distorted over eons of evolution and the presence of man. If you look at the Water Labyrinth as a central processing unit, a feedback loop or an amplifier then by now you may have already thought of other ways to use it. When I first realized its potential I immediately thought of a network of these devices built by people all over the world that could help buoy the subtle realms and help nature right itself. The water pump the device uses could even be run by a small solar panel and the device could be left to run itself. One could also construct an open Water Labyrinth utilizing troughs rather than tubes built slightly concave in the landscape. This would allow the water to flow by gravity from the outside in toward the slightly sunken center where it would be pumped back to the outside, over and over. The troughs could have vanes at appropriate bends and curves that would encourage the formation of left and right vortexes in the water. Also energizing stones creating eddies. Energizing patterns could be placed all along the water path to continually inform the water. Every trip through the labyrinth would generate more and more amplification for use by the environment and generate sound harmonizing to wildlife. If you intended the whole installation as a garden with plantings between the water-paths then I believe you would have an amazing self-contained, vitalized ecosystem. Variations on this design would adapt it to your local. I also believe it would remove negative, homeopathically energized frequencies that many believe are produced by water treatment plants. 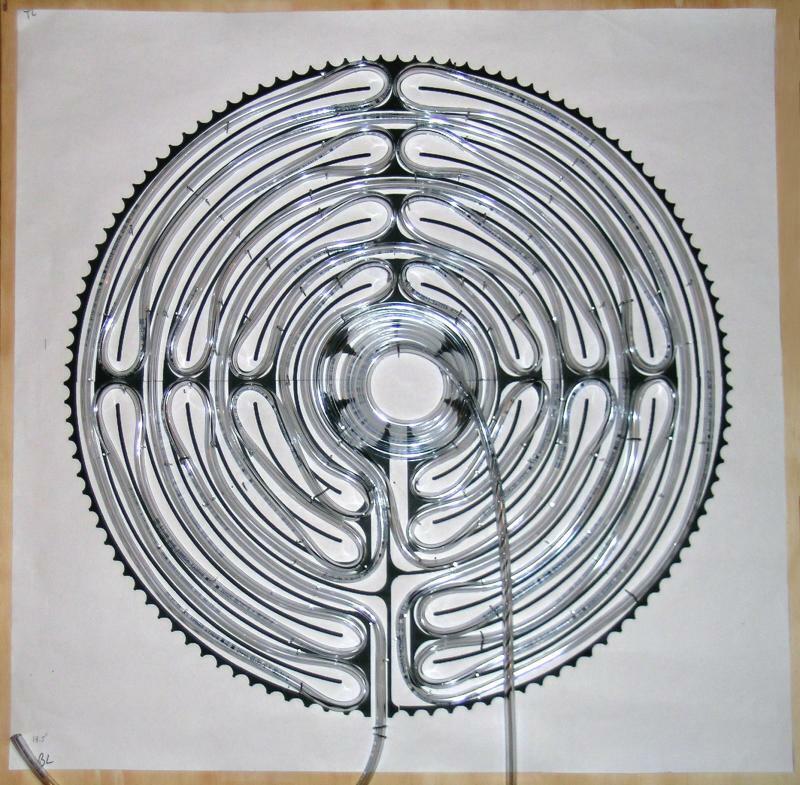 On a smaller scale a labyrinth made of garden hose coupled to a pump could circulate in a pond clearing stagnant energies. The output of the labyrinth could be fed into a waterfall or spray feature to add movement and oxygen to the water. The possibilities are endless. What is most important about this experiment is the effect on the energy field of water as it is circulated through geometric patterns. 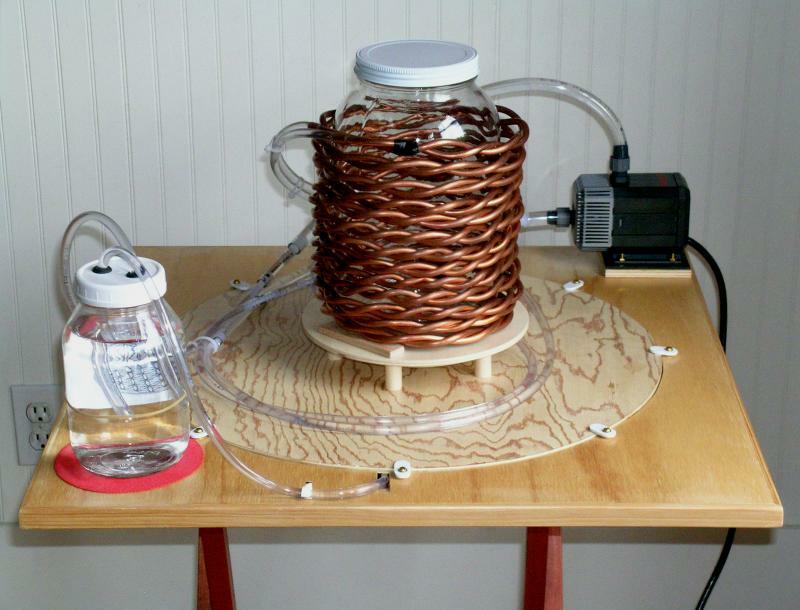 The quality and intensity of this electromagnetic amplification can be profound. The sacred geometry of crop circles and their location is closely intertwined with the crossings of both energy leys and underground water. This is no coincidence. For now, I hope this provides you some ideas for expansion by your own imagination. The following are pictures of my prototype labyrinth during construction. It was built in three days with simple off the shelf components and minimal tools. If you buy everything new it’ll cost about $100. 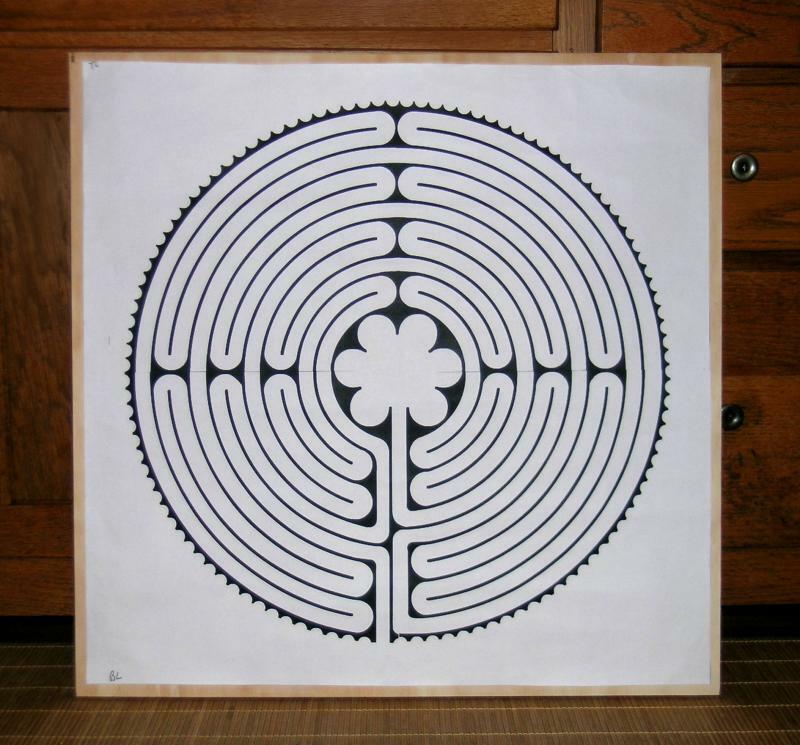 A Chartres labyrinth pattern was divided into four quarters on the computer, each quarter was printed on 8.5 x 11 inch paper then taped together to form one big pattern. This was then blown up at the copy shop and taped onto a piece of 1/2" thick plywood that is 2 feet square. 3/16" inside diameter vinyl tubing is held in place with small brads hammered into the plywood and bent over. It goes quicker than it looks. The tubing should come from a newer roll as the "memory" or curl from a roll that is nearer the core is much harder to work with. It is worth the time to go to several stores to find a newer roll. 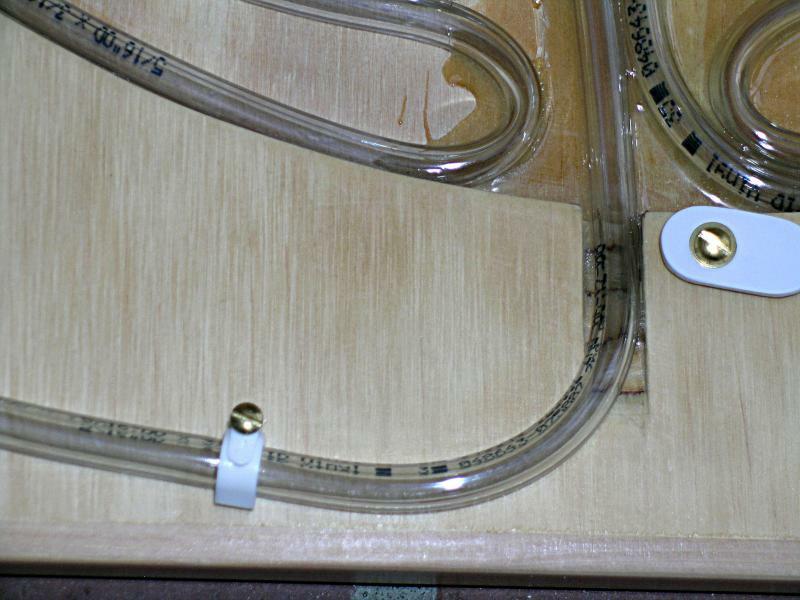 Allow the tubing to warm up to room temperature in a large, loose coil for a day or so to facilitate bending. Allow the tubing to "flow" onto the pattern by working with its natural curve. You'll need about 50 feet for this particular size project. This is the labyrinth base made from two pieces of 1/2" plywood glued together, one with a circle cut out, and the cover piece made from 3/16" plywood. Clamp and glue together the bottom pieces. Use no fasteners. The same applies to the edge molding. 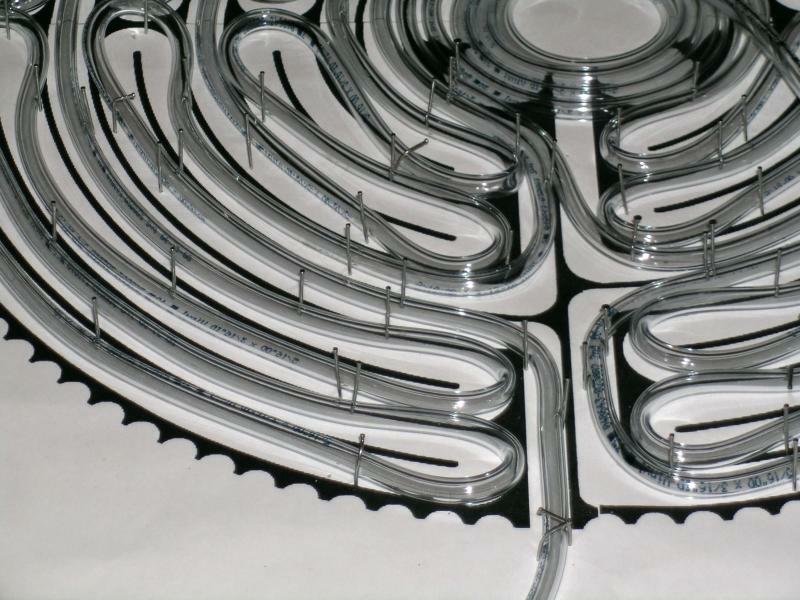 This shows the labyrinth tubing placed inside the housing. To accomplish this go back to image #2 above showing the tubing nailed to the pattern on plywood. Over this whole assembly place one big piece of clear contact paper and press firmly to the tubing. Wherever there is a nail cut a slit with an exacto knife to let it through and keep pressing down the contact paper making a good seal. Don't nick the tubing when doing this. Once finished you can remove all the nails (wait to do this just before you're ready to drop it into the base). Into the base assembly pour an "X" pattern of epoxy with a working time of 30 minutes. Now lift up the contact paper/tubing assembly and in one move drop it into the base onto the epoxy. Place the plywood cover over the whole thing and place weights on it and let set until the epoxy is cured. Then remove the cover, peel off the contact paper and remove any residue left behind. The black/white plastic inserts you see is where the tubing kinked and crimped and was replaced. This is caused on occasion by bending against the natural curve of the tubing. Just cut the piece out and replace with a length of new tubing joined with plastic in-line fittings. The eight white plastic cover hold-downs were cut from a piece of plastic I found at the hardware store. The fasteners are solid brass, not plated steel. This is the shock mount for the water pump to keep vibration at a minimum. 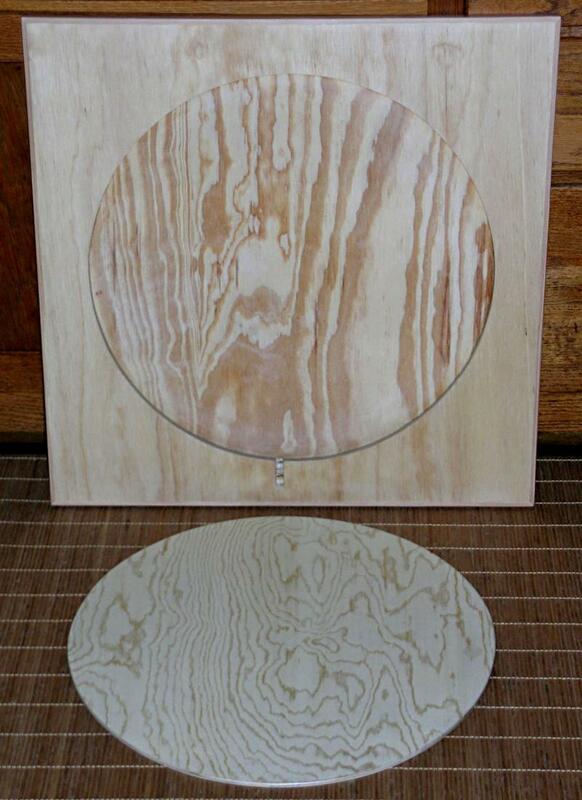 It's made from 3/8" plywood with the center cut out to leave 1/4" around the edges. Over this is glued 1/8" thick rubber from an auto parts store. The brass bolts conform to the base plate of my particular pump. 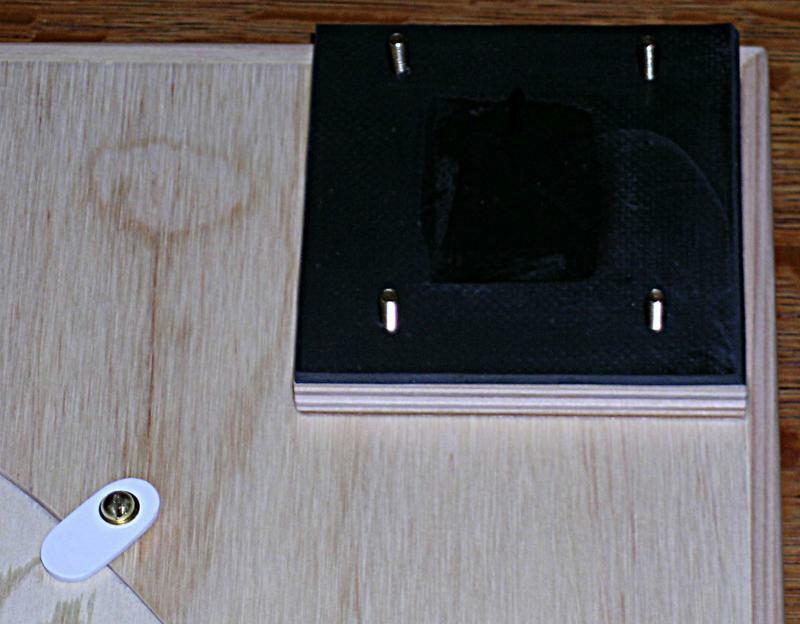 This assembly helps keep the plywood base from acting as a speaker broadcasting pump noise. 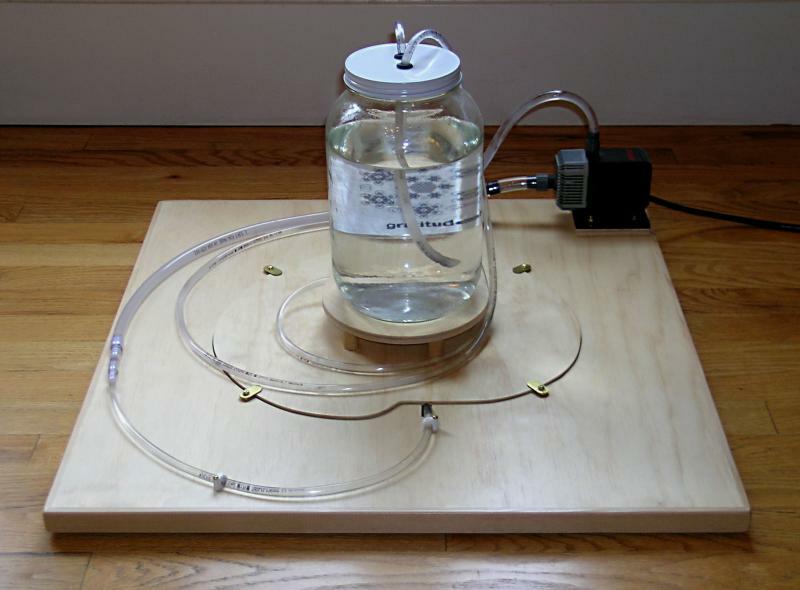 Here is the completed device with a one-gallon glass jar sitting on a base made of 3/8" plywood with legs made from 5/8" dowel. I stuck small rubber bumpers to the bottom of the jar and dowel legs to, again, help minimize vibration and movement. The pump is an Eheim 1046. The output of the pump goes to the entrance (input) of the labyrinth. 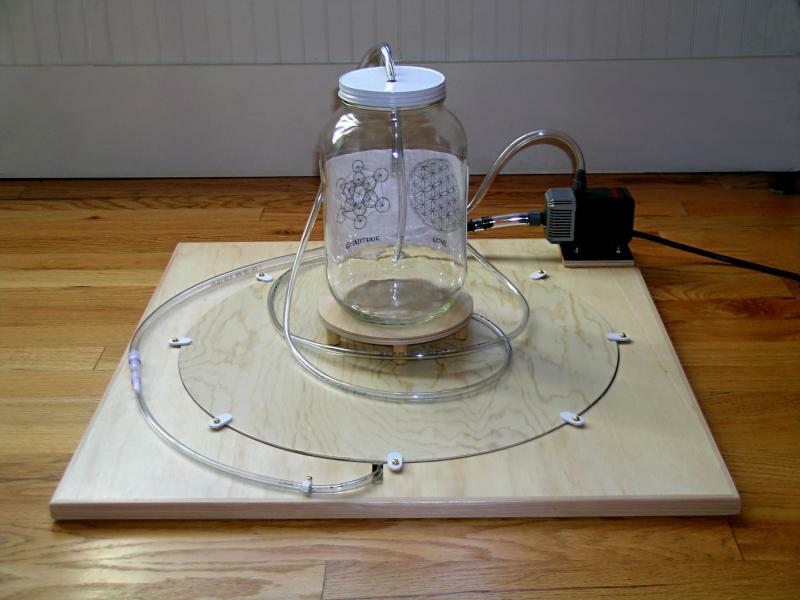 The output of the labyrinth (center) goes into the jar and is held near the top. The output tube of the jar, held near the bottom, goes to the input to the pump. Water should come up to near the top of the jar and both tubes should be submerged at all times to minimize air infiltration. 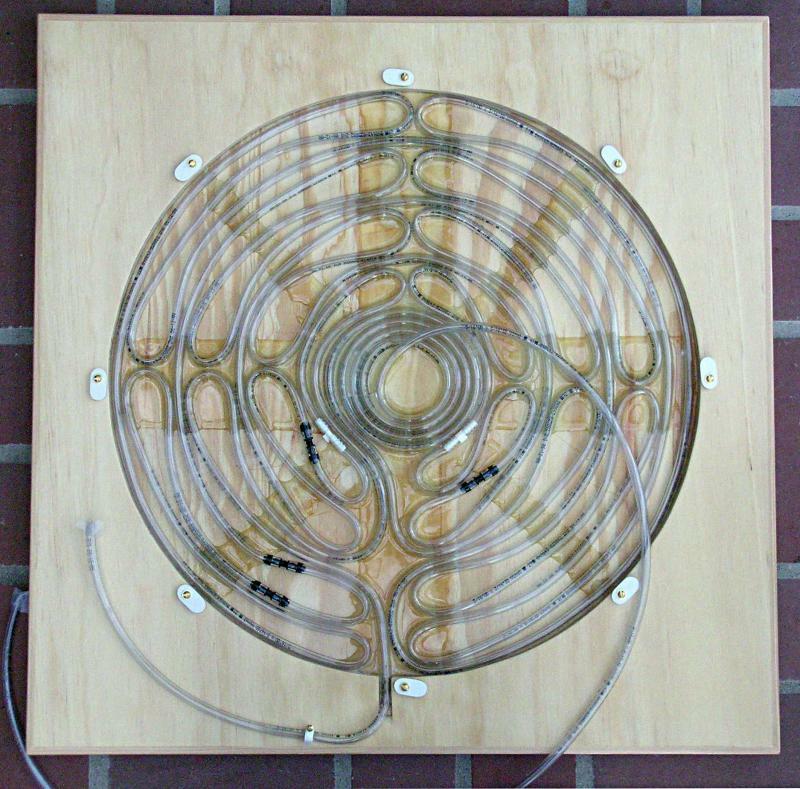 Note how all the tubing conforms to its natural curve and flows in a clockwise rotation around the unit. 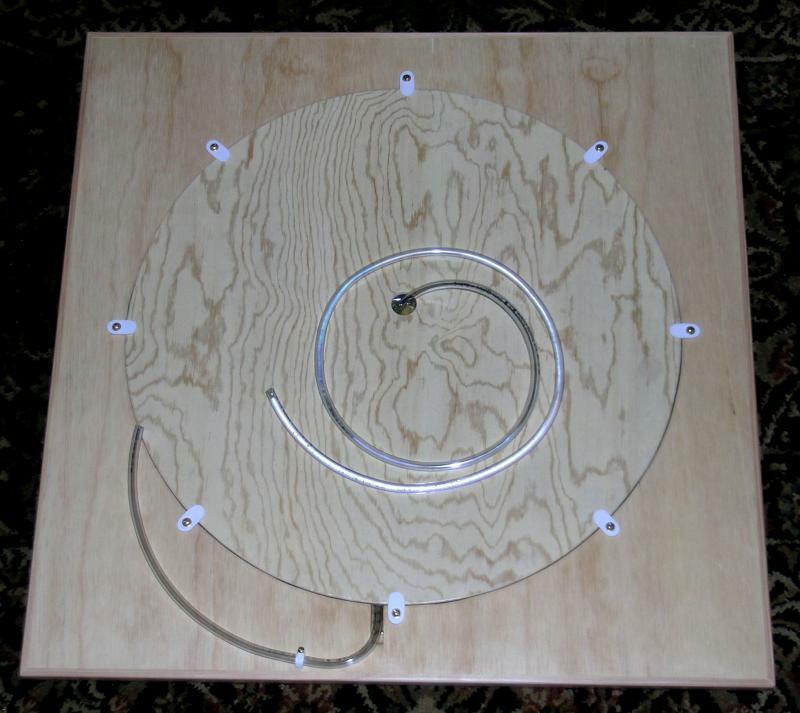 Here is a completed Seed Labyrinth as indicated by the shape of the base-plate cover. A final refinement is in the two grommets in the jar lid where the tubing passes through. This is to seal the environment of the labyrinth water. Notice how much smaller the base cover is compared to the Chartres labyrinth base cover. It takes much less tubing to make this unit. The overall base size is the same at 2 feet square. I also put rubber "feet" on the bottom of both labyrinths. The water in this jar has been circulating continuously since December 2008 (three years as of this writing). It is only slightly cloudy as you can see. In practice I wouldn't operate this long without replacing the water every six months to a year just to keep everything fresh. I would add an ounce or so of the mature water to the new water to prime it. As this is a proof of concept model I wanted to observe how things change over time. The main reason for mold or algae build-up in the water is the environment where the labyrinth is located. Mine is kept on the floor in a cool, dark corner of my office. Update: It is now four years since starting up this device and I've finally had to change the water. It has operated perfectly to date but the water had to be replaced and the unit cleaned. All things considered it was amazingly clean and there was no loss of energetic function. A simplified and faster way of constructing this labyrinth would be to use a router to carve out the seed pattern in wood and lay the tubing in the pattern. Using food grade plastic or glass for the labyrinth would be another worthwhile upgrade. The two pictures below show the effects of high ambient positive chi and the power of the mind on the structure of water. This is just plain tap water in ice cube trays. I've only been able to achieve these spikes once before several years ago during a two-week period of clearing a difficult property. They just appeared one day but looked exactly like terminated quartz crystals - tall, thin, faceted and elegant. My partner has always had the spikes appear in her ice cubes for as long as she can remember wherever she has lived. I believe, with her, there is an innate connection with her natural abilities and a positive life outlook and sense of humor that resonates with the water itself. As for me, I never could consciously achieve this little feat no matter how hard I tried. 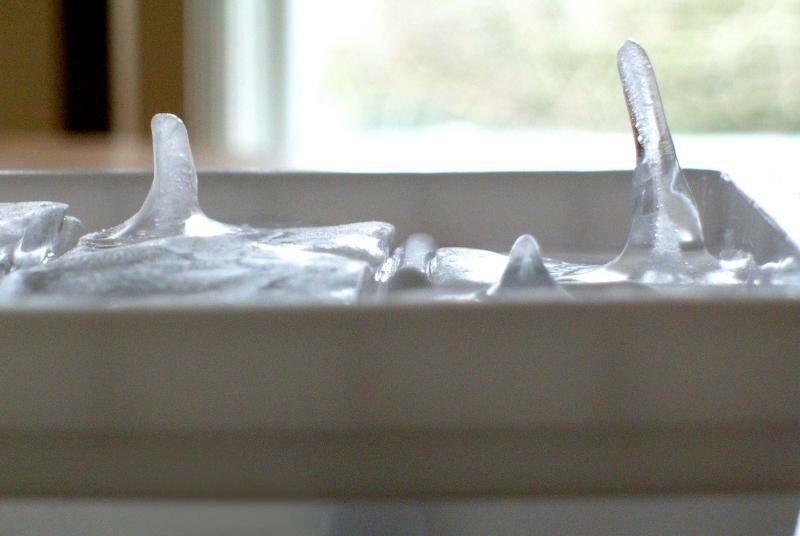 However, some time ago when Donna was again creating these ice structures I started trying again. Sure enough they appeared. And they did so almost every time I asked. I needed some pictures for this article so as I put the tray into the freezer I just visualized the spikes and thought to the water "Some spikes would be nice". And here they are. The only difference now is that the water labyrinth runs continuously in the background. I believe it is a link between thought and manifestation. It certainly is for me. I started using a Zero Water Filter a little while ago and immediately started getting very strong crystal growth in the ice cubes. This filter produces distilled-like water purity but without disrupting the structure of the water that you get from a distillation process. It illustrates what water can do if you remove all the stressors from it and offer beneficial frequencies radiating from the water labyrinth.These crystals appear virtually every day now and respond to thought like no other. The bottom right (next to last) image is a result of being in a very good mood one night when putting an ice tray in the freezer. I visualized a small forest of crystals growing and the next morning these appeared. Finally, all of this begs the question: Should I drink this water? This I cannot tell you as we all may react differently to various energy fields. Also, water recirculated repeatedly through the vinyl tubing may or may not be safe to drink. 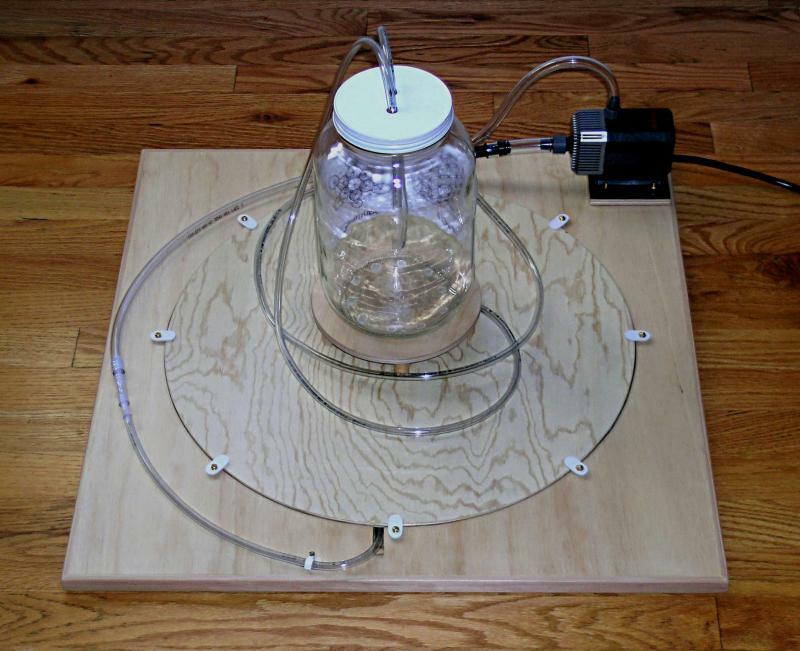 But if you want to transfer this enormous energy field to water in a glass jar then the Energy Amplifier pictured below will do the job. The copper tubing is refrigerator ice maker tubing sold in hardware stores in 50' lengths. Cut the tubing in half into two 25' lengths, place two ends in a vice and twist clockwise. The final length is exactly long enough to wind around a one gallon glass jar. ﻿The small jar on the front left is a "witness vessel" where pictograms, words or sound via headphones or coils can be added. I like to use the audio of "The Sound of the Sun", "Jupiters 528hz Connection" and "Holy Harmony" by Jonathan Goldman. The output of the pump goes into the witness vessel then into the labyrinth. The output of the labyrinth goes into the copper coils from bottom to top. The coils can be connected either in series, parallel or bifilar. Mine are connected in parallel. This works really well however it puts out a very powerful electromagnetic field as the water circulates that may be uncomfortable to be near for some people. I keep mine out in the garage. 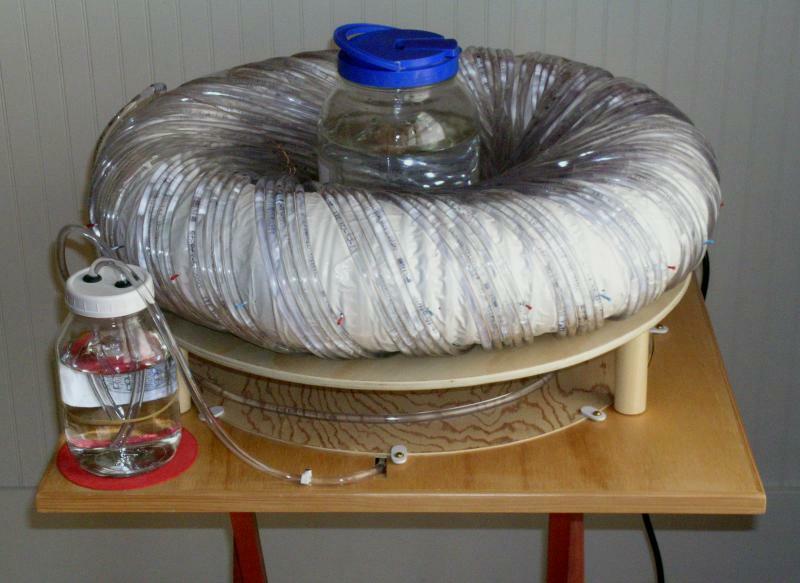 A three gallon per minute self-priming pump (not pictured), which is a little too large given the diameter of the tubing used in this particular version, with the coils hooked-up in parallel will produce water with an energy field radius of 90 feet in an hour and thirty five minutes - about one foot a minute. It will continue to expand until the device reaches an equilibrium. The Chartres Water Labyrinth featured in this article has an eventual range of several hundred miles in all directions. 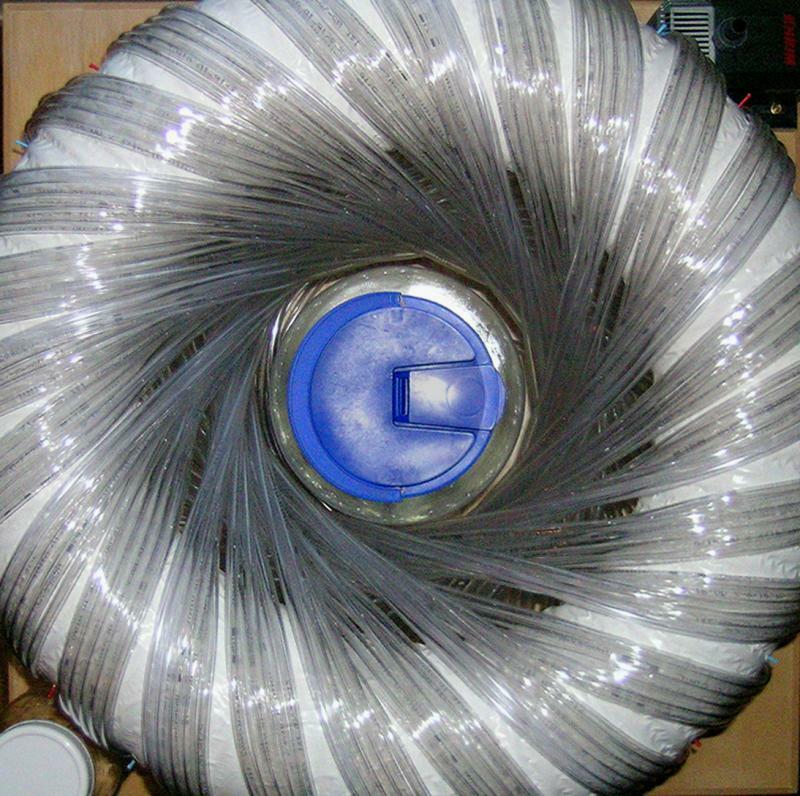 And finally, here is another energizer - a tube torus. These are traditionally made with copper wire and energized electrically. 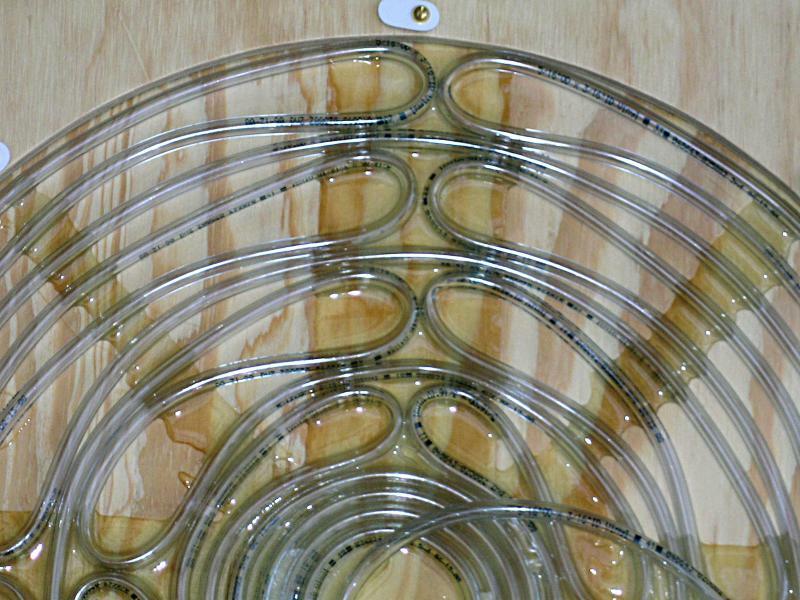 This one is made from vinyl tubing with water circulating through it. Winding patterns can be found online. The tubular form is 4" flexible drain pipe formed into a 2' circle and wrapped with four layers of white duct tape for ridgidity. There is a hole in the center of the torus support stand and the gallon jar sits on the same small wooden stand pictured above. Also, as above, the tubing may be connected either in series, parallel or bifilar. Bifilar (as this one is arrainged) is traditional. The Chartres labyrinth and torus total about 300' of 3/16" I.D. vinyl tubing. I would suggest a larger diameter tubing to make pumping easier. The beauty of the "Top View" image above is an example of the results obtained when working co-creatively with nature. All devices and components in this article were meant to be contained within a two foot square and interchangeable. When it came to making the tube torus I asked how many windings per circuit were needed and was told five. When finished and connected to the initial labyrinth design a one gallon jar fit perfectly within the center opening. There was no trial and error. Everything pictured in this article worked and fit together perfectly almost without revision given the materials and dimensions I decided to work with for experimental purposes. The Harmonizer was fine-tuned similarly.